Fernando Paolo and colleagues used 18 years of data from European radar satellites to compile their assessment. In the first half of that period, the total losses from these tongues of ice that jut out from the continent amounted to 25 cubic km per year. But by the second half, this had jumped to 310 cubic km per annum. "For the decade before 2003, ice-shelf volume for all Antarctica did not change much," said Mr Paolo from the Scripps Institution of Oceanography in San Diego, US. The satellite research is published in Science Magazine. It is a step up from previous studies, which provided only short snapshots of behaviour. Here, the team has combined the data from three successive orbiting altimeter missions operated by the European Space Agency (Esa). The findings demonstrate the value of continuous, long-term, cross-calibrated time series of information. Many of Antarctica's ice shelves are huge. The one protruding into the Ross Sea is the size of France. They form where glacier ice running off the continent protrudes across water. At a certain point, the ice lifts off the seabed and floats. Eventually, as these shelves continue to push outwards, their fronts will calve, forming icebergs. If the losses to the ocean balance the gains on land though precipitation of snows, this entirely natural process contributes nothing to sea level rise. But if thinning weakens the shelves so that land ice can flow faster towards the sea, this will kick the system out of kilter. Repeat observations now show this to be the case across much of West Antarctica. "If this thinning continues at the rates we report, some of the ice shelves in West Antarctica that we've observed will disappear by the end of this century," said Scripps co-author Helen Amanda Fricker. "A number of these ice shelves are holding back 1m to 3m of sea level rise in the grounded ice. And that means that ultimately this ice will be delivered into the oceans and we will see global sea-level rise on that order." Prof Fricker was speaking on this week's Science In Action programme on the BBC World Service. 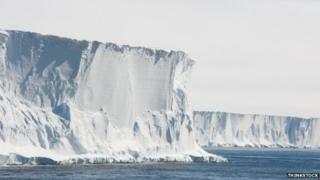 Various studies have now confirmed that the land, or grounded, ice in Antarctica is losing mass. Esa's current polar observing spacecraft, known as Cryosat, recently reported that the continent's ice sheet was diminishing at a rate of 160 billion tonnes a year. Cryosat found the average elevation of the full ice sheet to be falling annually by almost 2cm. It is thought that all this thinning is predominantly the consequence of warm water getting under the floating ice at the continent's margins to melt it from below. This warmer water appears to be being drawn towards Antarctica by stronger westerly winds in the Southern Ocean. But the precise drivers at work and their scale are poorly understood. And until scientists get a better grasp of some of these issues, their ability to project future change will be limited. Prof David Vaughan is the director of science at the British Antarctic Survey (BAS), and was not involved in the Paolo paper. He commented: "We need three components: we need to understand the changes in the grounded ice; how the floating ice is behaving; and finally how the oceanographic conditions under the floating ice have changed. With those three things, we have the basis for building really good models. Ten years ago, we didn't have any one of those elements. Today, we've made good progress on two, but on the oceanographic side we're only just beginning." BAS recently placed moorings in the Amundsen Sea in West Antarctica to gather data on ocean conditions. In the same sector, BAS also sent a sub under the floating shelf ahead of Pine Island Glacier to better understand how water moves under the ice.